Phil Davidson operating Cropster while roasting. The bean surfaces are delicate, and (in a classic-drum roaster) the drum is simultaneously very hot, a risky combination. The timing and magnitude of gas adjustments around FC are critical…when roasting a coffee that tends to crash early in FC, I often advise clients to avoid lowering the gas in the window of time from 45 seconds before to 45 seconds after the beginning of FC. (The specific advice to clients is more nuanced than that, as the timing of adjustments depend on the timing of the crash and the rate of roasting. However, FC +/- 45 seconds suffices for this post.) Lowering the gas within that time window will exacerbate any potential ROR crash. Simply raising the gas at FC (presumably just before a crash begins) to mitigate the crash is a terrible choice— I won’t go into that here, but if you currently use that strategy, find a way to avoid a crash without raising the gas; if you match the curves well (ie. roast two nearly identical curves, one created by raising the gas at FC and the other without raising the gas) you’ll taste the difference. If you can’t taste the difference, cup the roasts blindly with someone with a more experienced and sensitive palate, something worth doing anyway. There’s more to roasting than creating an aesthetically pleasing ROR curve — how you create that curve matters tremendously. I consider raising the gas at FC “cheating,” in the sense that it may produce a great-looking curve, but harms coffee flavor. While a nice curve may be a prerequisite for an optimal roast (note: “optimal”, not “I think it tastes good”), it is not a guarantee of an optimal roast. To time the gas settings perfectly throughout a roast, it’s critical to know precisely when FC occurred, or will occur. Having experience with a given coffee may help a roaster predict the bean temperature of FC. However, the curve leading up to FC and the ROR and ET readings at FC may alter the bean-probe reading at FC for a given coffee. I’d like to propose a system that is better than simply listening for FC or assuming FC will always arrive at a given bean-probe reading. Several roasters have remarked on the behavior of the ET curve at FC; depending on the location and sensitivity of the ET probe, the ET curve may arc up during FC. (If you have an inlet-temperature curve, that may arc up even more.) You can see a version of that phenomenon in the curve below. Close up of roast with proper FC marked. Note that the operator marked FC at 9:35, but I have placed a vertical line at 9:13 at the trough of the ET ROR curve. I believe that the ET ROR trough is usually the best indicator of the “real” beginning of FC. 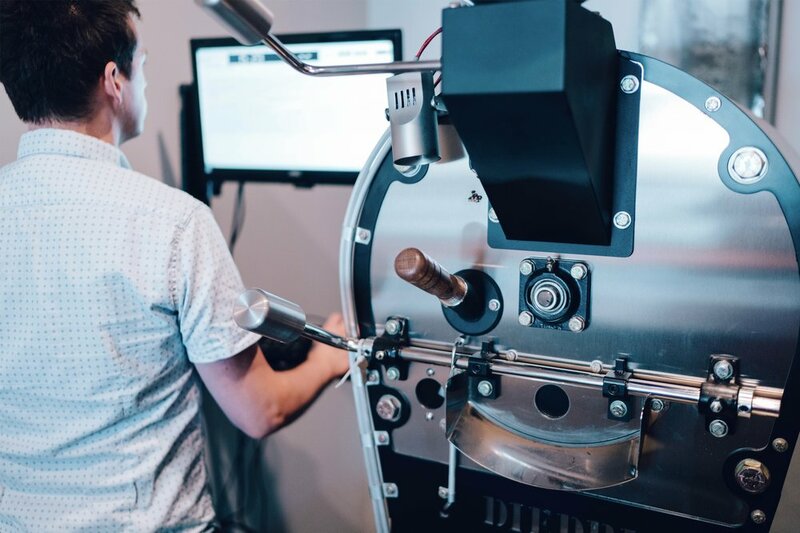 Some exceptions to this would be if the operator had decreased the gas shortly before the ET ROR troughed, FC began in a prolonged, erratic manner (as may happen with some coffees), or some decafs and naturals that crack gently or erratically. I believe the ET ROR jumps for several reasons, but I don’t claim to completely understand the dynamic (there isn’t enough scientific evidence for anyone to understand it completely.) Part of the explanation seems to be that the release of moisture and gas from beans as they fracture increases the flow of hot air passing the ET probe. I’ve often wondered why the BT ROR crashes at the same time the ET curve jumps up. This may not be the complete reason, but I will speculate that the moisture escaping the beans cools their surfaces and, more importantly, deflects some of the hot air attempting to penetrate the beans. The combination of cooler moisture and deflected hot air causes the BT ROR to crash, while the greater amount of hot air passing the ET probe causes the ET curve to jump. I believe FC really began at 8:05… this coffee is a fresh-crop Rwanda that crashes unusually late in FC. What if I mark FC at the wrong time? If you mark FC too early or too late, simply add a new “First Crack” comment in Cropster… the software will assume the new FC timing is the proper one and will adjust FC and the live DTR counter accordingly. You may clean up your redundant comments by making a new “dummy” comment at the exact time of the incorrect FC comment. For example, in the roast above, if I want to eliminate the FC comment at 8:43, I may choose to make a new comment at 8:43, type “x” and then press “Text Comment”. That will add the comment “x” at 8:43 and delete the old FC comment. Since I have begun teaching clients to mark FC using the trough in the ET ROR, they have been better able to keep their ROR’s smooth, avoid crashes, and even roast a little darker without an ROR crash or flick. Mind you, this strategy doesn’t always work, particularly if one lowers the gas shortly before the crack. In such cases, some experience with this method will help. Many thanks to Jerome of Structure Roasters for his tutelage in some of the scientific dynamics at play during first crack.